We hope you all are having a wonderful summer. Can you believe this week puts us at the half way mark of our CSA season? The shorter day length always takes me off guard this time of year. But as the garlic hangs curing in the shade we know every day is getting a bit shorter; all the more reason to savor our beautiful summer in Montana. With highs in the upper 80s and 90s this week it may seem a bit premature to be thinking about cold nights but late July is the time we are busily planting many of our Fall crops. It can seem like a crazy thing to keep planting when we have so much bounty, but the only way to have many of our favorite veggies in the Fall is to plan for them now. This week we will break ground for some new garden beds for next year. We use 30 inch by 100 foot beds, and currently have 144 of them in production. We are currently using an ‘intensive’ method where as soon as a bed comes out of production it is planted to the next crop. To increase efficiency, next year we want to keep production the same but increase the number of beds. We spend about two weeks in the winter planning the planting schedule for the coming year. Next year we would love to have more flexibility with planting dates and more permanent beds will allow us to do that. For example, we do six plantings of carrots a year. Due to irregularities in weather, beds don’t always ‘clear out’ as timely as we would like in order to make space for the next crop. It’s really exciting to think about having enough bed space to have all the carrots for the year in the same area with space to clear out beds as conditions require rather than on a set schedule. Another infrastructure upgrade coming up for us is the addition of a second 34’ x 100’ high tunnel in late summer this year. Up until this year, we have done all infrastructure upgrades in the off-season; but last year with such an unusual wet fall and an unusual cold wet spring, we found it’s just too risky to try to get ALL our projects done in the off season. Many, if not most, need to get done when the farm is at full production. This is both challenging and exciting. High-tunnel construction step one: Get out the 100' tape. We’ve stopped thinking of upgrades as something to put off for the fall and spring, and so each week we find ourselves making changes to the farm. For example, we noticed a few weeks ago that our greens washing area was too small to accommodate our growing roots washing needs. We spent a little of our precious time digging (with a tractor) a big hole next to our pack shed, and filled it in with drain rock and gravel. With a few hoops left over from the prop-house build and a shade cloth, we now have a lovely roots washing station. In years past, because we didn’t give time to making farm improvements, we spent about an hour a week fighting ‘farm entropy’ and trying to tread water to keep everything going. This year the farm gets BETTER every week. It’s really neat to see the farm grow and change so much over the course of a single season. So instead of recipe ideas I’d like to take a bit of space to talk about the week’s photo/list and what is in your box. 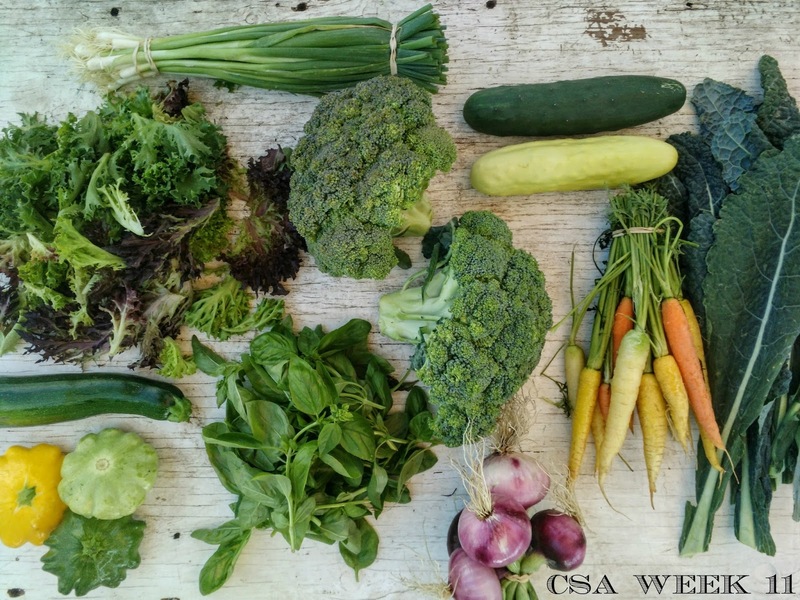 The CSA photo and weekly list are a guide to what will be in your box each week. We work to make sure there will be the exact quantities available for harvest so all the boxes follow the weekly photo and list. But we make the list on Sunday, and sometimes we start harvesting and realize there is enough to put more in the box, or that we might be short on some items. For example there may be fewer cucumbers and more zucchinis than we thought/or vice versa. Or we may be short just a few broccoli and sub in a few cauliflower, etc. Jay and I are both, by nature, very generous people, and we LOVE loading the boxes up with bounty. Also, we know that if we overload your box beyond a 20% savings it’s also not good for our growing business. So, this is the time of year when I have to exercise the most restraint with what goes in the box. The Full Share value comes out to be $26/week and Partial Share value is $18. Sometimes we include something like a 5 pound cauliflower (that’s a $15 cauliflower!) and we know we are a bit above our goal of not exceeding $30 value / week for a full share. But, overall, in the summer we try to limit ourselves and keep the box value reasonable. 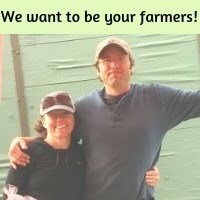 We are constantly striving to make CSA be a good deal for you and something sustainable for us as our farm continues to grow. Be sure to be paying attention to what you like getting in your box, what you go through the most, and what you would like more of. We will be doing a survey in September and we really love the response we get from you about CSA. Over the years we have loved getting great suggestions from our customers! Wednesday August 16, 6-7:30 p.m.